It seems like these stories are popping up out of nowhere nowadays. Assistant coaches and little boys seem to cause bigger problems than Global Warming or the US declaring bankruptcy. Everybody knows about how Linebacker U got blown up by Sandusky and his shenanigans. Now the Orange is under attack because Bernie Fine, Syracuse’s assistant mens’ basketball coach, is being accused of fooling around with three ball boys for over a decade. 39 year old Bobby Davis, who was a Syracuse ball boy for six years and an alleged victim, claims that the sexual contact started when he was 12 years old and lasted 15 years until the age of 27. Mike Lang, Davis’ older stepbrother by six years, claims that Fine molested him while he was in fifth or sixth grade. The other alleged victim, Zach Tomaselli, claimed that Fine molested him in a Pittsburgh hotel room in 2002. Tomaselli is facing sexual assault charges himself involving a 14 year old boy in Maine. Syracuse head coach Jim Boeheim is also under fire for allegedly knowing about it and not speaking up, the same thing ex-head football coach at Penn State, Joe Paterno, was fired for. 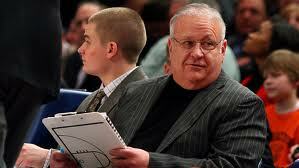 Boeheim is standing by his assistant coach. The scandal is still under investigation by the U.S. Attorney’s Office and U.S. Secret Service. This incident couldn’t come at a worse time considering the fact that 3rd ranked Syracuse has started off the season guns blazing with a 7-0 undefeated record so far. If this situation is as true as the media is portraying, Syracuse might fall into the same ditch that Penn State is in right now with recruiting. Stand out offensive lineman, Joey O’Connor, is one of the prospects that have recently uncommitted to PSU after the scandal in Happy Valley. Syracuse basketball might fall victim to the same issues with recruiting. Not only would the future athletes of Syracuse be timid about attending the university, but fans might turn a cold shoulder on the Orange. Although Boeheim received a standing ovation when he walked into the Carrier Dome when his team played Eastern Michigan on November 29th, Syracuse support might slide down a slippery slope if these allegations are found to be true. Hopefully these allegations are false and Syracuse University will be able to get past this incident without many repercussions. If these claims are in fact true, Syracuse athletics will be in some hot water.